2015 Spring Art Fair showcasing the best of Cornish Art. Then open every day from 11am – 4pm until Sunday 12th April when it will close at 2.pm. As well as the regular Lizard Art Members we will have highly acclaimed artists Andrew Tozer as Guest Artist and also contributions from 30 other artists around Cornwall. 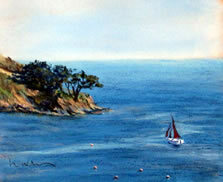 I paint what excites me and hope to convey that excitement to the viewer. My starting point is usually about colour: the turquoise sea you just want to dive into, flashes of red on fishing boats, deepest crimson on a pomegranate, shimmering colours on freshly caught fish. I trained as a sculptor and find I am drawn to paint form: cliffs, boats, fish, bowls of fruit are all about trying to sculpt in paint, to get right into the shadows that define the form while also celebrating the colour. I paint from life, which can involve working outside on the coast in all weathers, stormy seas are exciting to paint but rain and watercolour do not work well together, that is when I come indoors and paint still life. 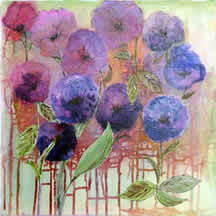 I paint mostly in Watercolour with drawing in pencil or conte crayon playing a big part in my work. I run watercolour and mixed media painting workshops at various venues around Cornwall including at my studio near Mullion Cove. I also run children’s workshops at Trebah Gardens in the school holidays. I live within sight of Mullion Cove and still cannot believe my luck in being able to live and work in such a stunning and inspiring location. 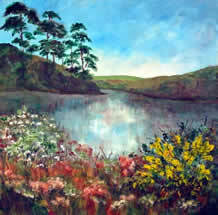 Taking early retirement in 2005 and returning to Cornwall, I found that I had the time and the wish to paint seriously. Being a self-taught artist means that learning comes by way of playing . After experimenting with watercolour, oils and acrylics, I then tried pastels and immediately realised that this was my media and haven’t looked back. Although I love my pastels, I do miss the wonderful movement of wet paint – watercolour however, has a complete mind of its own and defies me to gain its ownership but playing with acrylics has become quite a joy. I hope that by Open Studio this year I will have a small group of work to exhibit. 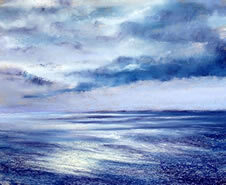 It is to catch the very essence of atmosphere and mood that feeds my desire to paint. To see the changing light, seasons and therefore the colours, I never tire of walking my favourite haunts looking and watching for that special moment that will draw my eye. To find new territories is a great excitement – there is nothing like discovering a huge sky throwing light onto slices of a new panorama to make me reach for my pastels.